Writing spiders are VERY beneficial to your garden because they help catch and kill, flies, bees, wasps, mosquitoes, aphids, moths and beetles. And the writing spiders are NOT poisonous to humans. 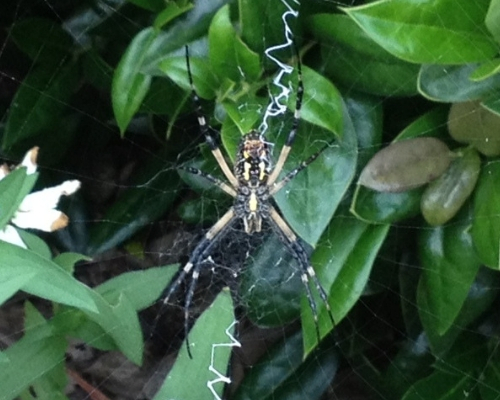 Writing Spiders go by many names: yellow garden spider, black and yellow garden spider, golden garden spider, zigzag spider, corn spider, or McKinley spider. So, if you happen to see these ladies in your garden, leave them be…they are actually helping you!